"Every one deserves a defense...every person matters"
Bridge of Spies is a movie without combat, cars, or gunshots, but its as good a film is gonna get without all three. A decent plot, some great humour, amazing characters...this is some fine & memorable work by Steven Spielberg and the team. To start with, yes, this is a film without action sequences. It was never intended to, and it didn't have. Unfortunately, a guy like me always reserves some points for good old action sequences, because that's one of the reasons I go to the movies. Thankfully, while the film does feel long and lacks the action, it isn't draggingly long or even close to boring, because the characters themselves are interesting and the dialogue is great, with a lot of the humour coming out from the witty dialogues. So, yes, there are some very interesting characters in the film. 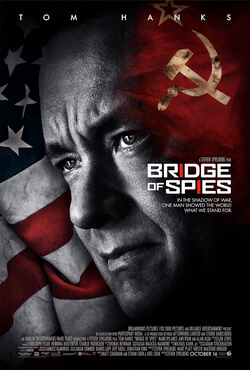 Tom Hanks' James B. Donovan is one of them, no surprise there. He has great character moments and some excellent, meaningful lines. Couple that with Tom Hanks' acting ability, and yes, he's a character you'd root for. But the surprise standout for me is Mark Rylance's Rudolf Abel, the soviet spy. I've never heard of the actor before this film, but wow! He's so great as this character. Very charismatic, and speaks with short, simple, witty lines. Amazing character!! (And now I can see why Spielberg decides to get him as the lead for his next film, The BFG). And there's some excellent & loveable humour between these two characters. Now, the plot...when I think about it, the plot isn't actually great. In fact, it's rather predictable and a little too convenient in how it unfolds. But then the ending really gets me. The climactic scene and the ending is brilliant. I just love it. And maybe, to me, it compensates the lack of an intense plot throughout. And I suppose, when you have an ending as good as this one, it makes the 2 hours you spend feel very much worth it. Again, without action, this is as good a film is gonna get. Very great characters - Excellent humour & dialogue - A good enough plot, and with an exceptional ending. It really is a good film, though you have to forgive me for putting some emphasis on the lack of action. But its one of the reasons why I (hopefully, we) go to the movies. So, what I would say is this...this is a must watch film...but not a must watch on the cinema. There's no added thrill in watching it in the theatre, but its a film you really have to watch at one point. It's worth it.